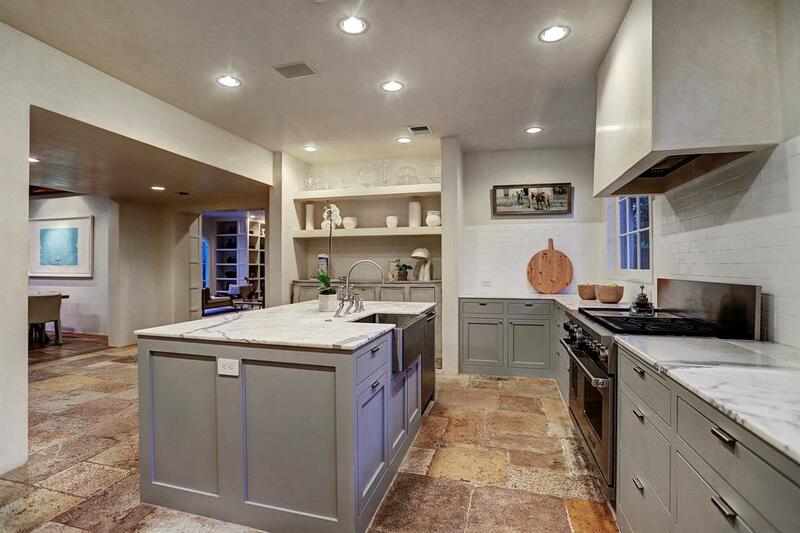 This home for sale in Houston caught my attention mainly because the kitchen looked familiar. Upon further inspection, I learned Pam Pierce was a design consultant when this 1920’s Tudor Revival was renovated. 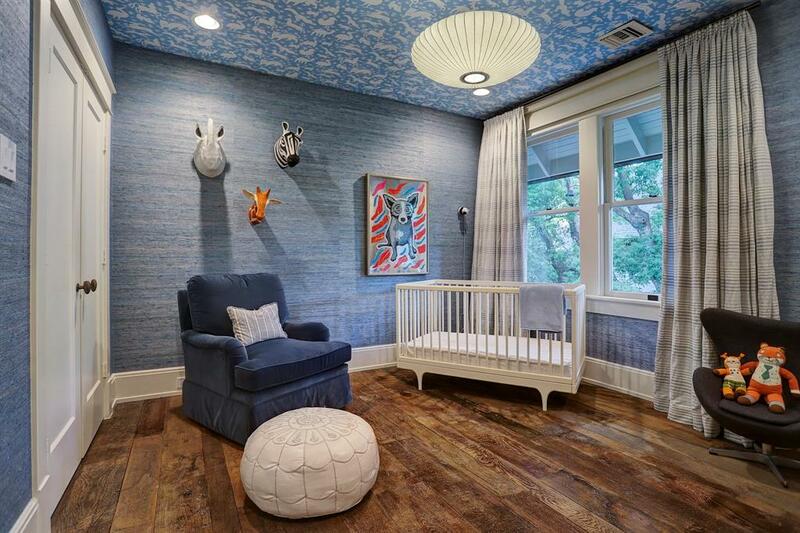 Today’s 12 Luxurious Interior Design Details: Tudor Revival in Houston – places this exceptional home for sale in the spotlight where it belongs and suggests at least a dozen smart design details on which to chew. I knew I recognized this kitchen as a Pam Pierce beauty! Design Consultant: Pam Pierce. House tour: 1924 Tudor Revival. 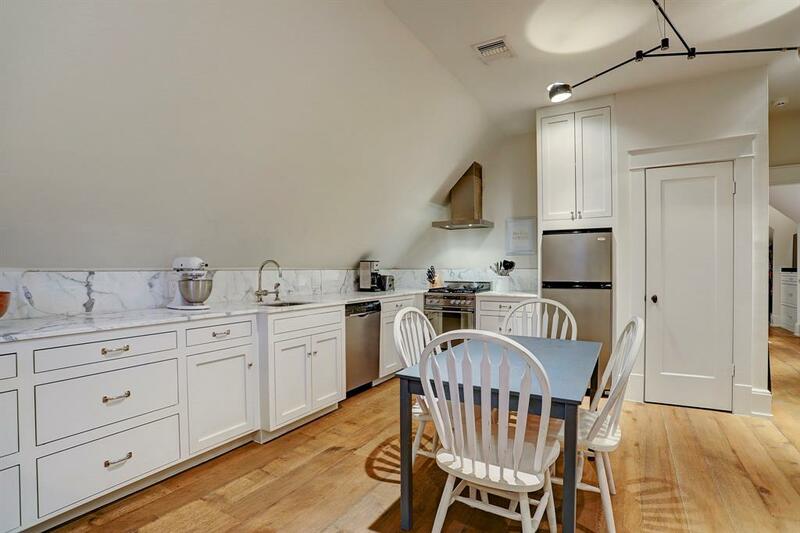 Beautiful design details in the renovated kitchen include: reclaimed limestone flooring imported from France, and Venetian plaster walls/ceilings as well as statuary marble counters. Additionally, flush mount cabinets and drawers, kitchen island with additional storage, and trash and recycling drawers lend modern convenience too. Kitchen appliances: stainless steel interior and exterior Sub-Zero Frig/Freezer with two freezer and two frig drawers; Sub-Zero ice maker; Wolf range with six burners and griddle; Bosch dishwasher. Also, kitchen sink is a stainless farm sink. Luxurious Interior Design Details: Tudor Revival in Houston – certainly lovely indeed! 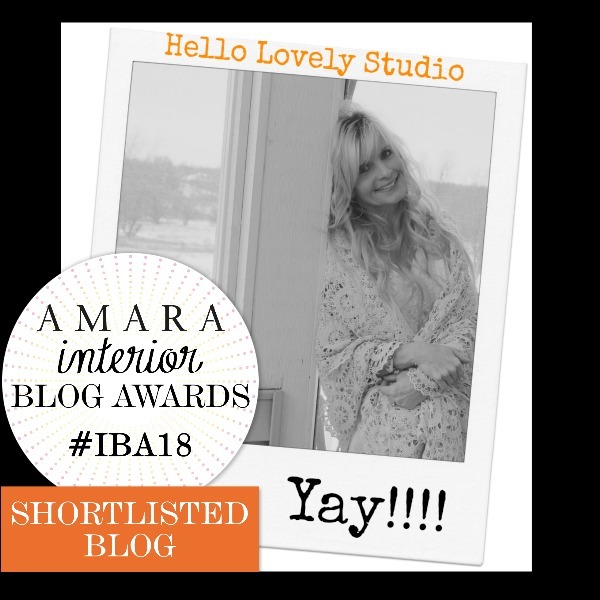 Additionally, some exciting news to share which has zero to do with gallbladders or pain…yep, you helped me make it on to the short list for Amara Interior Blog Awards BEST WRITTEN BLOG! Merci beaucoup for your loyal support and readership!!! 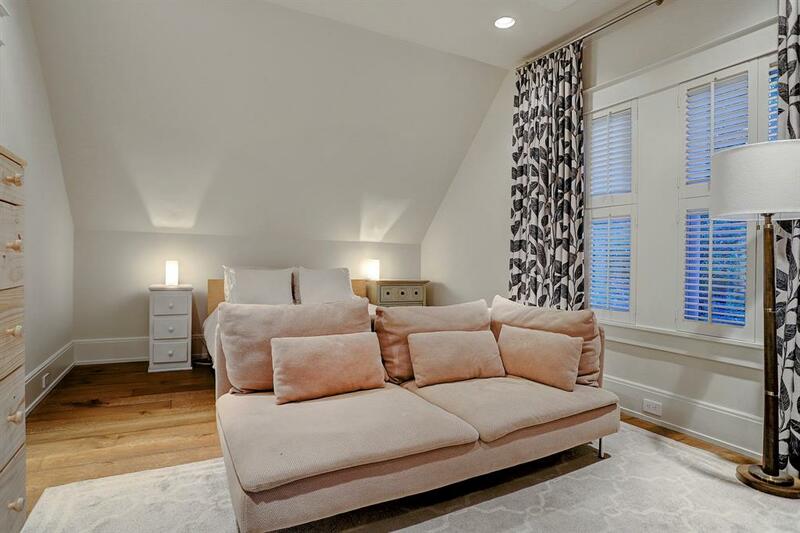 While I love shelter magazines, design books, and inspiring photos of interiors online, there is also much to appreciate about plain Jane photos from real estate listings when you are curious about the design’s foundation and not necessarily all the finishing touches, yes? Such images are less likely to be retouched or over-styled as well. We can actually see the materials and bones of the spaces without all the layering of art and adornment. A timeless and lovely facade! This Tudor Revival was built by Russell Brown Company in 1924-25 for J. F. Fuesler. The residence is for sale and has been beautifully renovated to preserve its architecture as well as its character. Renovating architect: Michael Dreef, AIA, Eubanks Group. Design consultant: Pam Pierce, ASID. Landscape: Glauser McNair. Luxurious Interior Design Details: Tudor Revival in Houston…certainly lovely indeed! 1611 South Boulevard is a spacious open floor plan with 6 bedrooms, 4 1/2 baths, and 6,374 square feet. There is a pleasing flow to the outside patios, pool, and exquisite garden as well as an airy pool pavilion with summer kitchen. A light-filled, professionally-equipped gathering kitchen is unique and timeless, and the sumptuous master suite hse custom-fitted closets. Additionally, note the lavish use of reclaimed elements which include: antique chestnut and Burgundy limestone floors, ancient stone fireplace mantels, vintage doors and cabinets, and rough-hewn antique ceiling beams. Also of note: amart-home automated system; extensive bespoke window coverings; glass pool fence; and porcelain-tile garage floor; guest house. $4,995,000. A mix of modern and also ancient in a living room. Design Consultant: Pam Pierce. Luxurious Interior Design Details: Tudor Revival in Houston – certainly lovely indeed. 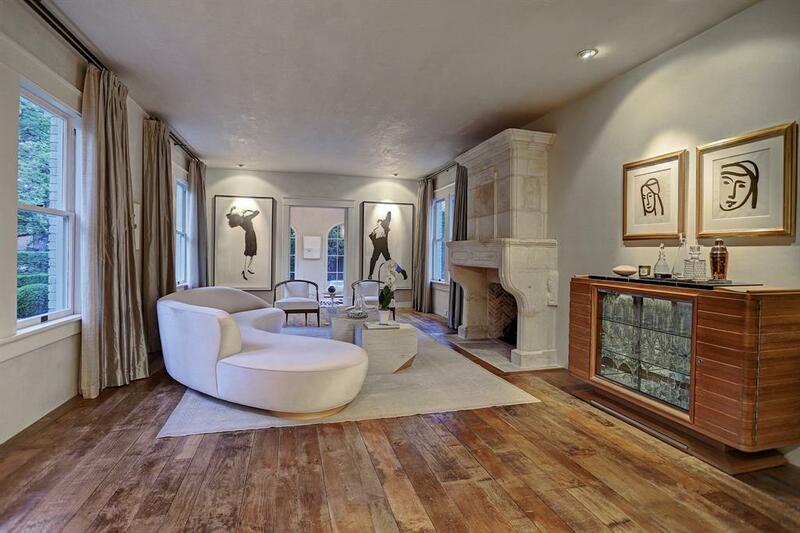 In the formal living room, luxurious design details include: reclaimed wide plank chestnut flooring imported from France and also Venetian plaster walls/ceilings. Note the milled archway to entry and French doors to garden room too. The masonry fireplace has an 18th Century stone mantel imported from France. The windows are original and were refurbished. House tour: 1924 Tudor Revival. The home’s garden room is flooded with natural light. Design consultant: Pam Pierce. 12 Luxurious Interior Design Details: Tudor Revival in Houston – certainly lovely indeed. House tour: 1924 Tudor Revival. In the garden room, note the reclaimed limestone flooring imported from France (“Burgundy Stone”). Also worth mentioning: additional Old World design details including Venetian plaster walls/ceilings. 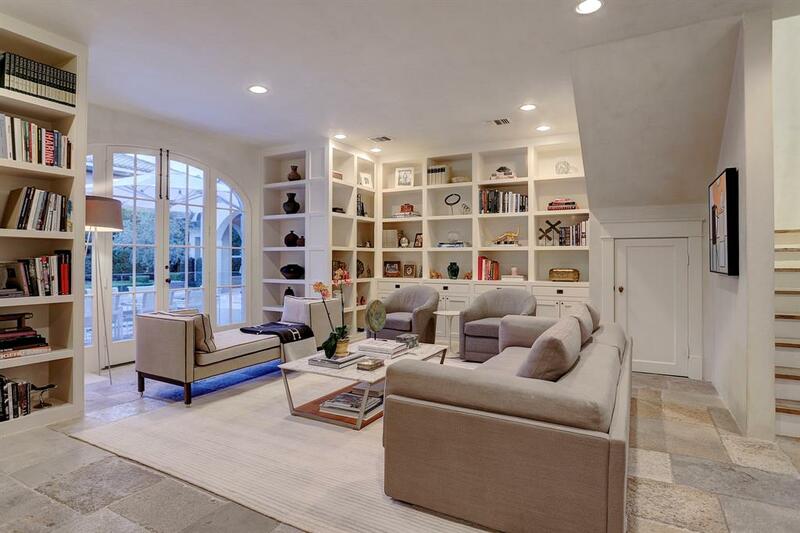 stunning sconces, arched windows (North and South exposures), and two sets of arched French doors. Outside the French doors, a fenced side yard has a fountain. 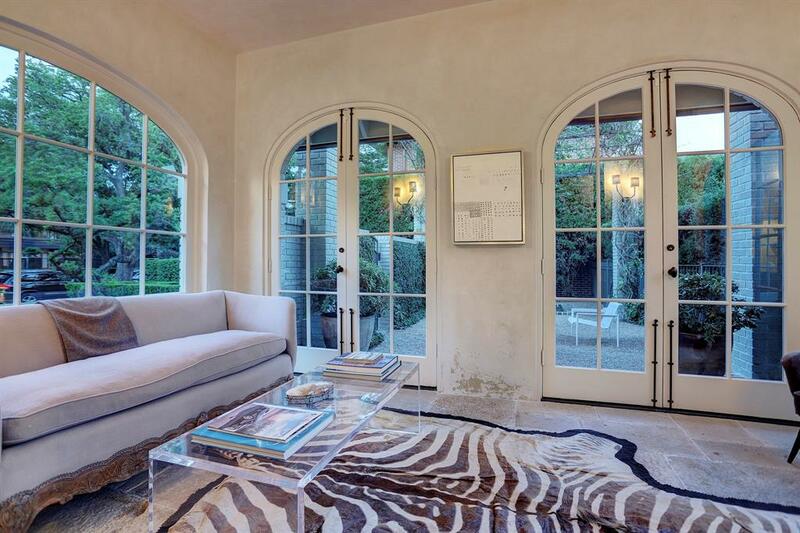 Additionally, French doors link to the formal living room. Yes, it is possible to effectively mix modern (and even edgy!) with Old World. FIND LOVELY EXAMPLES OF A PEEK-A-BOO ACRYLIC MODERN COFFEE TABLE…RIGHT HERE. A charming study with custom built-ins is a “study” in cozy. Design consultant: Pam Pierce. 12 Interior Design Details: Tudor in Houston – certainly lovely indeed. House tour: 1924 Tudor Revival. This home’s study features high end design features including reclaimed limestone flooring imported from France (“Burgundy Stone”). Old World interior design elements include Venetian plaster walls/ceilings and custom mahogany arched French doors to backyard. Also of note, built-in bookshelves with cabinets and drawers line the walls. The study overlooks the yard, garden, pool, and pool pavilion. Additionally, luxurious design elements include: recessed lighting, recessed speakers, door to wet bar, back staircase with reclaimed wide plank chestnut solid wood treads, and door to driveway. There is a storage closet under the staircase as well. Creamy plaster on walls, sandy linen upholstery, and various shades of white create a calm cocoon for reading and lounging with tone on tone style. 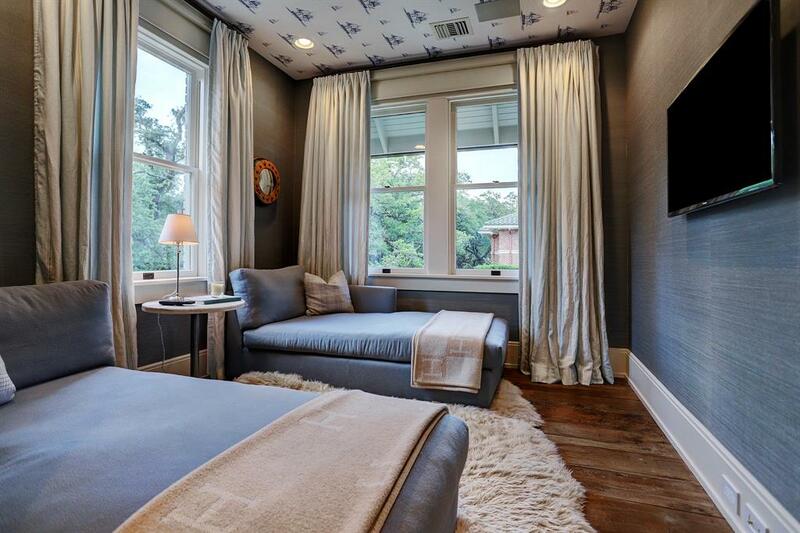 SEE GORGEOUS IDEAS FOR PLASTER WALLS AND WALL FINISHES FROM HOUSTON-BASED SEGRETO FINISHES Right Here! 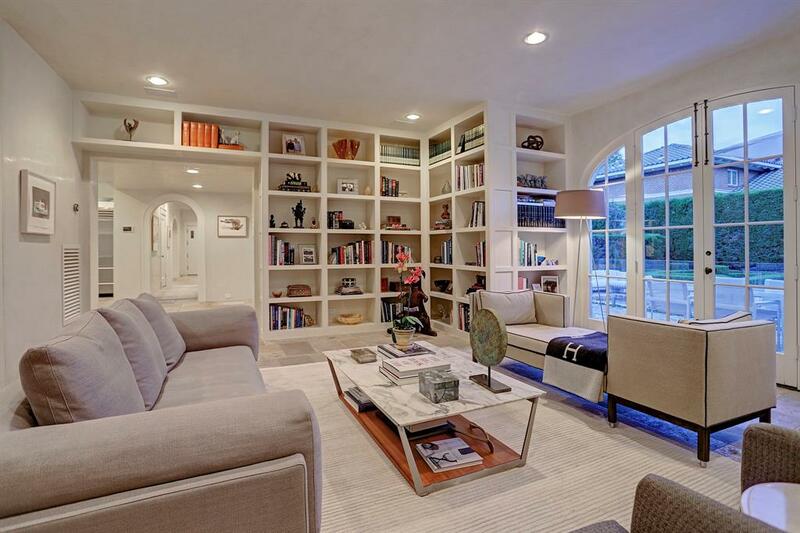 Classic and comfortable study with custom built-ins and a garden view as well. Design consultant: Pam Pierce. 12 Luxurious Interior Design Details: Tudor Revival in Houston – certainly lovely indeed. House tour: 1924 Tudor Revival. This home’s study features high end design features including reclaimed limestone flooring imported from France (“Burgundy Stone”). Old World interior design elements include Venetian plaster walls/ceilings and custom mahogany arched French doors to backyard. Built-in bookshelves with cabinets and drawers line the walls. The study overlooks the yard, garden, pool, and pool pavilion. Additionally, luxurious design elements include: recessed lighting, recessed speakers, door to wet bar, back staircase with reclaimed wide plank chestnut solid wood treads, and door to driveway. There is a storage closet under the staircase too. Need a friendly-priced linen sofa for your own space? I found THIS versatile SOFA and more options RIGHT HERE. Timeless and tranquil kitchen. Design Consultant: Pam Pierce. House tour: 1924 Tudor Revival. Beautiful design details in the renovated kitchen include: reclaimed limestone flooring imported from France, Venetian plaster walls/ceilings, and also statuary marble counters. Additionally, flush mount cabinets and drawers, kitchen island with additional storage, and trash and recycling drawers lend modern convenience. Kitchen appliances: stainless steel interior and exterior Sub-Zero Frig/Freezer with two freezer and two frig drawers; Sub-Zero ice maker; Wolf range with six burners and griddle; Bosch dishwasher. Kitchen sink is a stainless farm sink. Luxurious Interior Design Details: Tudor Revival in Houston – certainly lovely indeed! 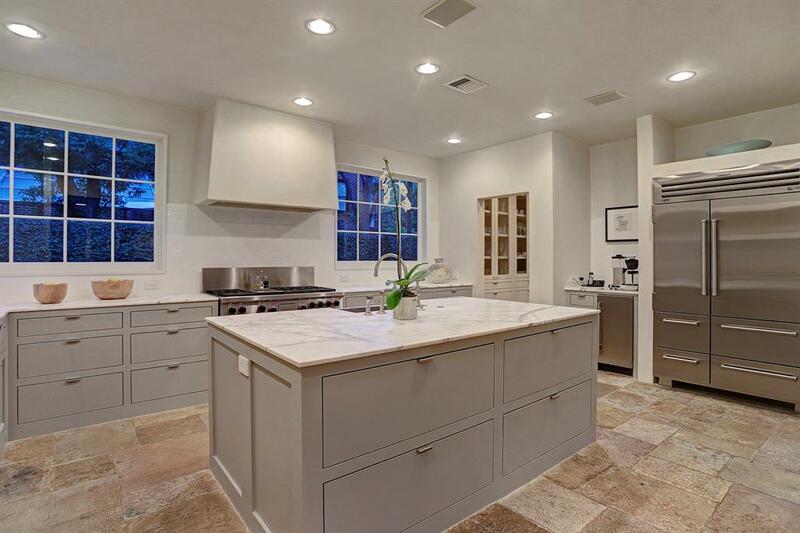 Isn’t the stone flooring in this Houston kitchen beyond amazing!?! Design Consultant: Pam Pierce. House tour: 1924 Tudor Revival. Beautiful design details in the renovated kitchen include: reclaimed limestone flooring imported from France, Venetian plaster walls/ceilings, and also statuary marble counters. Additionally, flush mount cabinets and drawers, kitchen island with additional storage, and trash and recycling drawers lend modern convenience. Kitchen appliances: stainless steel interior and exterior Sub-Zero Frig/Freezer with two freezer and two frig drawers; Sub-Zero ice maker; Wolf range with six burners and griddle; Bosch dishwasher. Kitchen sink is a stainless farm sink. Luxurious Interior Design Details: Tudor Revival in Houston – certainly lovely indeed! Natural and warm in tone, stone adds so much handsome character, depth and texture to a kitchen when you are after a rustic luxe look. The interplay of “pretty” with “rugged” can be sensually thrilling. The family room with television. Design consultant: Pam Pierce. 12 Luxury Interior Design Details: Tudor Revival in Houston – certainly lovely indeed. House tour: 1924 Tudor Revival. Design details in the family room include: reclaimed antique beamed ceiling, reclaimed wide plank chestnut flooring imported from France, and Venetian plaster walls. Additionally, note the recessed and art lighting, recessed ceiling speakers, and two sets of custom mahogany French doors. Doors lead to backyard garden, pool, and pool pavilion. Window treatments are custom curtain panels and custom rods. The spacious master bedroom with sitting room is bathed in natural light. Design consultant: Pam Pierce. 12 Luxurious Interior Design Details: Tudor Revival in Houston – certainly lovely indeed. House tour: 1924 Tudor Revival. 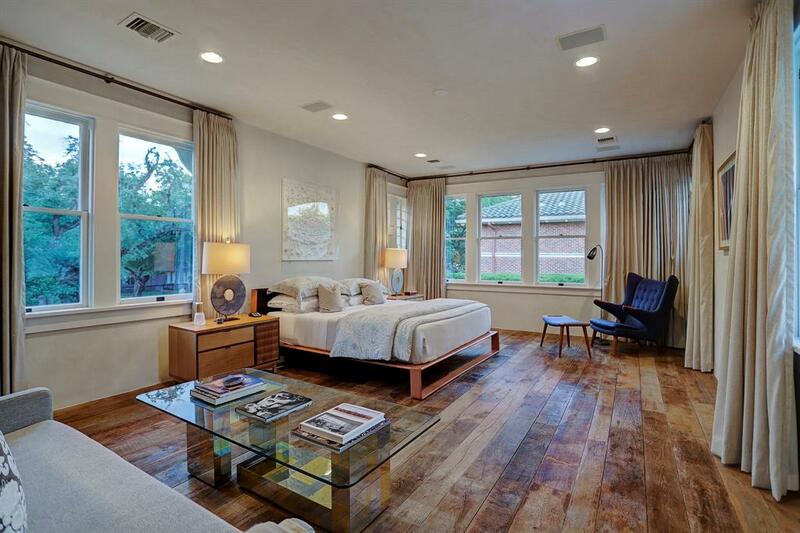 Design details in the master bedroom include original windows (refurbished), Venetian plaster walls/ceilings, reclaimed wide plank chestnut flooring imported from France, and custom curtains and rods. Also note the original wavy glass panes in windows. Lighting details include recessed and art lighting. Whether introduced in flooring materials, ceiling beams, or a statement wall, wood’s rugged texture and natural warmth of wood adds an organic layer of lovely and rich character to surrounding pristine finishes. Sitting room in the spacious master bedroom suite. Design consultant: Pam Pierce. 12 Luxuriouso Interior Design Details: Tudor Revival in Houston – certainly lovely indeed. House tour: 1924 Tudor Revival. 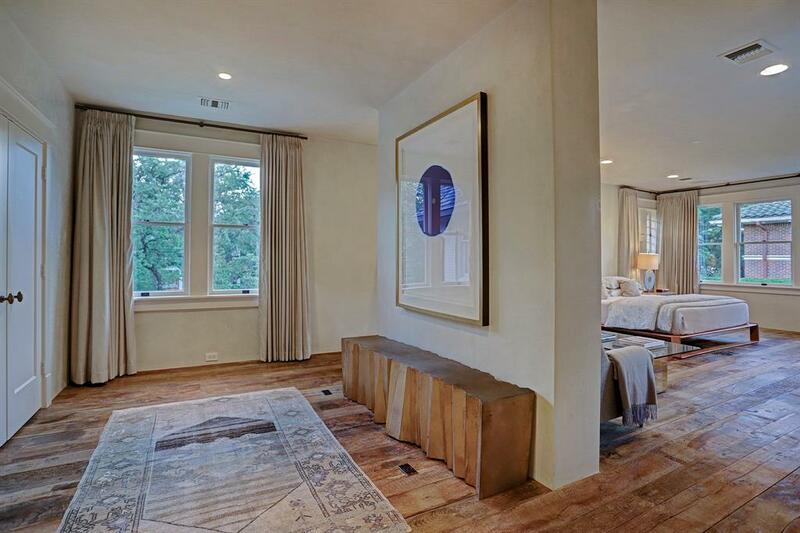 Design details in the master bedroom include original windows (refurbished), Venetian plaster walls/ceilings, reclaimed wide plank chestnut flooring imported from France, and custom curtains and rods. Also note the original wavy glass panes in windows. Lighting details include recessed and art lighting. Additionally, reclaimed antique French doors imported from France bring Old World charm. Love the idea of a rustic wood bench for your own bedroom? Find some examples RIGHT HERE (no need to limit your search to “interior” or “bedroom” benches when you’re after a rustic look and can consider exterior ones). Heavenly marble master bathroom. Design consultant: Pam Pierce. 12 Interior Design Details: Tudor in Houston – certainly lovely indeed. House tour: 1924 Tudor Revival. Master bath design details include: Calcutta marble floors, walls, counters, shower & tub surround and walls. Additionally, note the Venetian plaster ceiling, double vanities with Waterworks sinks, and wall-mount Waterworks faucets. A Waterworks undermount soaker tub is enviable, as is the walk-in closet with reclaimed chestnut wood floors, built-ins, and a full length mirror. The bathroom storage includes flush mount cabinets and drawers. More bathroom design details include: shower with rain showerhead, bench, hand shower, and seamless glass enclosure. For new builds or renovations, if there is space in the plan for a wide opening to accommodate double doors to the bathroom, a luxuriously grand entrance is sure to heighten the drama. 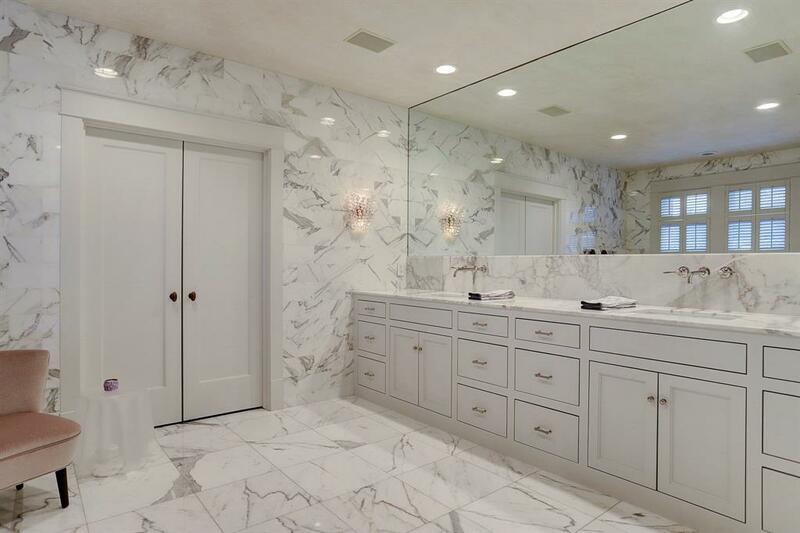 If you love Calacatta marble, this master bathroom has your name all over it! Design consultant: Pam Pierce. 12 Luxurious Interior Design Details: Tudor Revival in Houston – certainly lovely indeed. House tour: 1924 Tudor Revival. Master bath design details include: Calcutta marble floors, walls, counters, shower & tub surround and walls. Additionally, note the Venetian plaster ceiling, double vanities with Waterworks sinks, and wall-mount Waterworks faucets. A Waterworks undermount soaker tub is enviable, as is the walk-in closet with reclaimed chestnut wood floors, built-ins, and a full length mirror. The bathroom storage includes flush mount cabinets and drawers. More bathroom design details include: shower with rain showerhead, bench, hand shower, and seamless glass enclosure. 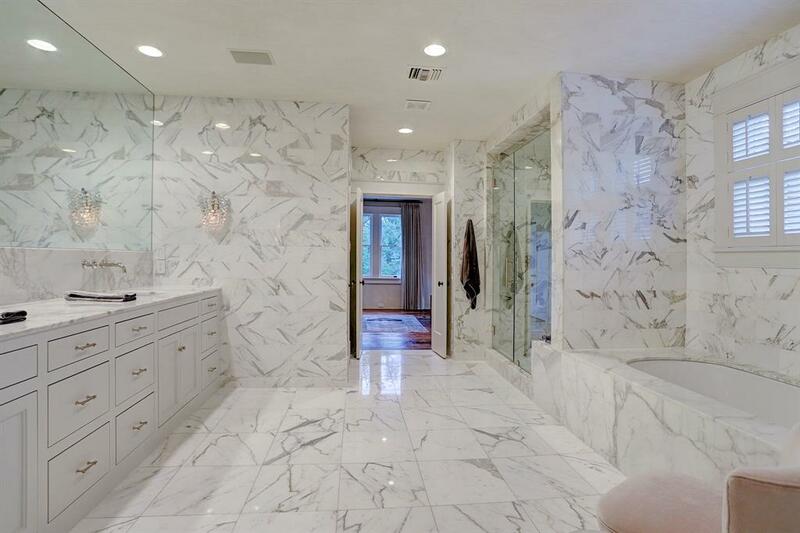 Marble marvel in a luxe master bathroom. Design consultant: Pam Pierce. 12 Interior Design Details: Tudor in Houston – certainly lovely indeed. House tour: 1924 Tudor Revival. Master bath design details include: Calcutta marble floors, walls, counters, shower & tub surround and walls. Additionally, note the Venetian plaster ceiling, double vanities with Waterworks sinks, and wall-mount Waterworks faucets. A Waterworks undermount soaker tub is enviable, as is the walk-in closet with reclaimed chestnut wood floors, built-ins, and a full length mirror. The bathroom storage includes flush mount cabinets and drawers. More bathroom design details include: shower with rain showerhead, bench, hand shower, and seamless glass enclosure. If a pale pink velvet chair is beckoning you, SEE THESE LOVELIES. The master bedroom closet has built-ins and lovely reclaimed chestnut floors. We’re definitely in fantasy-land today–but if your closet has space for a dresser or built-ins, drawers are a luxurious and lovely addition. The sleeping area of bedroom 2 feels like a tree house and is ready for the kids. Design consultant: Pam Pierce. 12 Luxurious Interior Design Details: Tudor Revival in Houston – certainly lovely indeed. House tour: 1924 Tudor Revival. Interior design details in the bedroom include: grass cloth wallpaper, reclaimed wide plank chestnut flooring imported from France, and recessed lighting. Additionally, the bedroom features a sitting room and Hollywood bath. 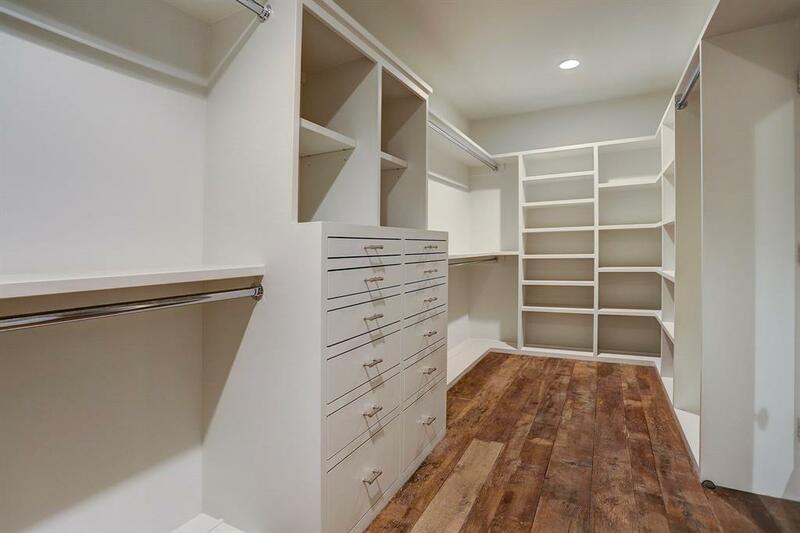 The room’s walk-in closet includes built-ins. The original windows have been reworked/refurbished and original wavy glass panes retained, while the curtains and rods are custom (and note electronic blackout shades). Sitting room of bedroom 2. Design consultant: Pam Pierce. 12 Interior Design Details: Tudor in Houston – certainly lovely indeed. House tour: 1924 Tudor Revival. Luxurious interior design ideas in the bedroom include: grass cloth wallpaper, reclaimed wide plank chestnut flooring imported from France, and recessed lighting. Additionally, the bedroom features a sitting room and Hollywood bath. The room’s walk-in closet includes built-ins as well as original windows (reworked/refurbished) with original wavy glass panes retained. Also of note: custom curtains and rods (and note electronic blackout shades). Even though these chaises reside in the sitting room of a child’s bedroom, the idea to outfit a guest room or den with a pair of chaises (in lieu of twin beds) is a dreamy prospect for everyday lounging as well as overnight guests. For a luxurious linen daybed, SEE THIS ONE and also OPTIONS HERE. Bedroom 3 is a true blue place for imagination to bloom. Design consultant: Pam Pierce. 12 Luxurious Interior Design Details: Tudor Revival in Houston – certainly lovely indeed. House tour: 1924 Tudor Revival. Interior design details include a wallpapered ceiling, reclaimed wide plank chestnut flooring imported from France, and grass cloth wallcovering on walls as well as recessed lighting. Additionally, original windows were reworked/refurbished with their original wavy glass panes retained. Custom curtains and rods as well as electronic blackout shades. 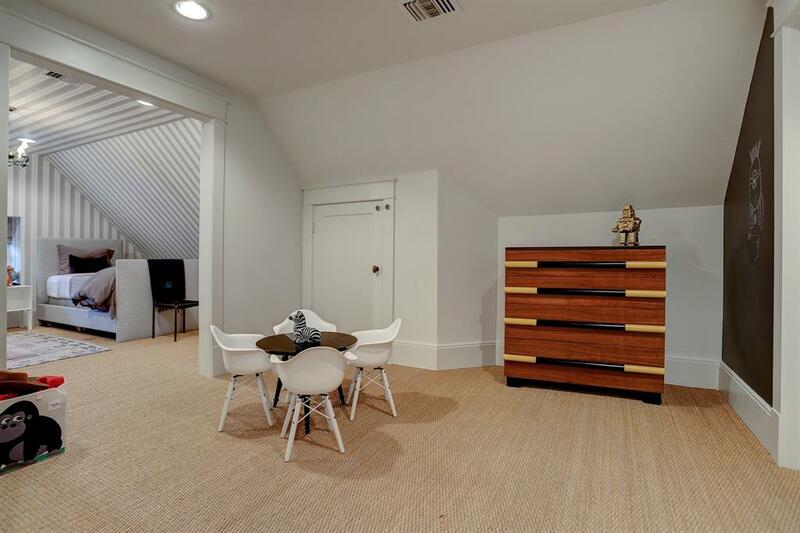 This bedroom has a Hollywood bath and two closets too. These WHITE LEATHER POUFS look good anywhere! 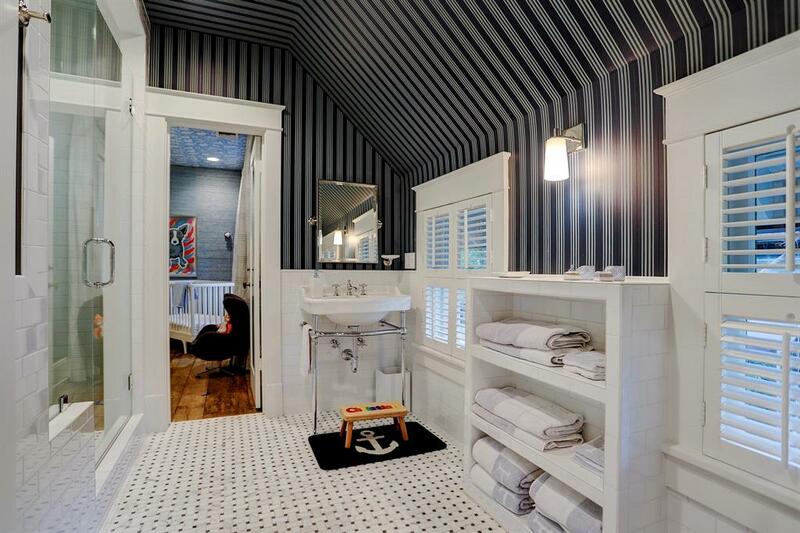 Bathroom with 1920’s charm and preserved architecture. Design consultant: Pam Pierce. 12 Luxrious Interior Design Ideas: Tudor Revival in Houston – certainly lovely indeed. House tour: 1924 Tudor Revival. 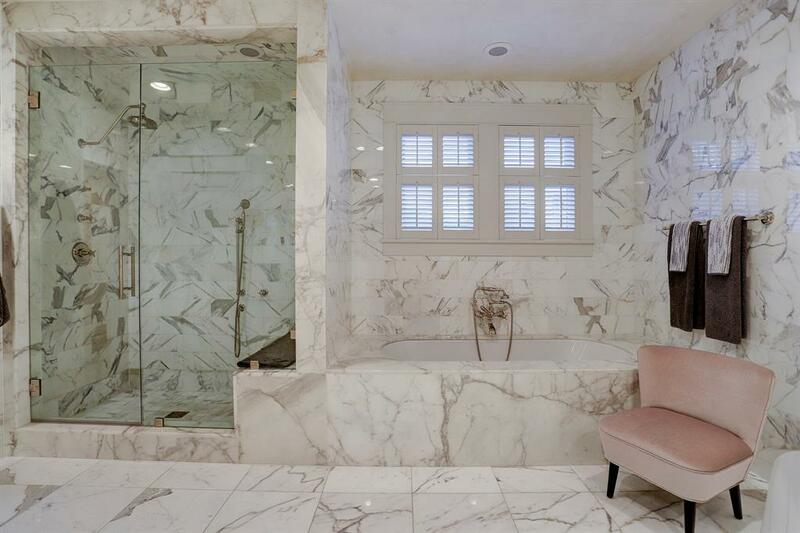 The Hollywood bath with marble tile floor has granite inlay. Additionally, luxurious design details include: recessed and sconce lighting, custom made mahogany windows, and plantation shutters. Built-in towel shelves are tiled and above them are wallpaper walls and a wallpapered ceiling too. Also, note the tile wainscoting, double pedestal sinks, and shower with seat and hand shower too. 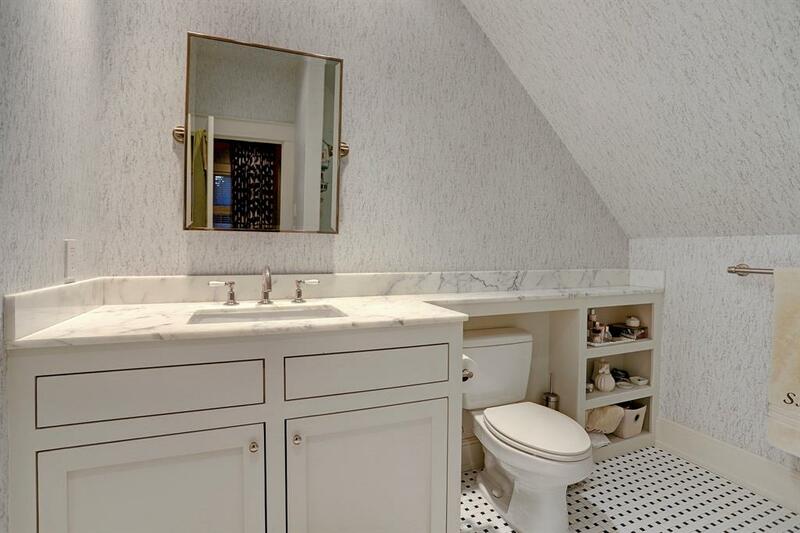 The water closet features Waterworks commode as well as wallpapered walls and ceiling. Much to admire about these shallow tiled bathroom shelves for bath essentials and pretty decorative objects. We put a luxurious and traditional style console sink in our downstairs bath, and I’m sold! Considering a console sink for your own bath? SEE THESE POSSIBILITIES. Bedroom 4 has original details, Old World additions, and modern function. Design consultant: Pam Pierce. 12 Luxurious Interior Design Details: Tudor in Houston – certainly lovely indeed. House tour: 1924 Tudor Revival. This bedroom features design details such as reclaimed wide plank chestnut flooring imported from France, and recessed lighting as well as original windows with wavy glass panes. Additionally, custom blackout curtains and rods, double closets, and a private bath complete the suite. Love a leather butterfly chair? FIND LOVELY OPTIONS HERE. Stripes rule in Bedroom 5. Design consultant: Pam Pierce. 12 Luxurious Interior Design Details: Tudor in Houston – certainly lovely indeed. House tour: 1924 Tudor Revival. Bedroom 5 resides on the third floor and features wallpapered walls and ceiling too. Additionally, find recessed lighting, seagrass carpet, a charming chandelier, window seat, custom window covering, private play room, full bath, and a closet too. 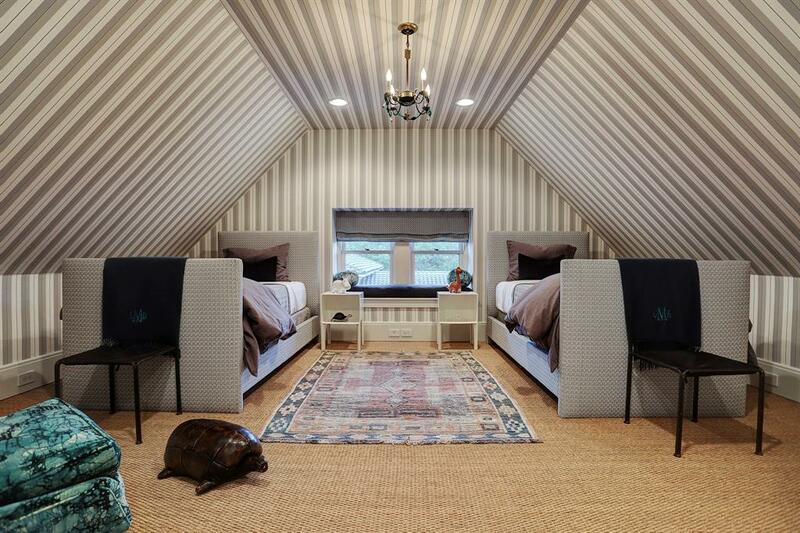 Bedroom 5’s play room has seagrass carpet, recessed lighting, andwall of chalk paint, as well as attic access. Stunning marble bathroom. Design consultant: Pam Pierce. 12 Luxurious Interior Design Details: Tudor in Houston – certainly lovely indeed. House tour: 1924 Tudor Revival. 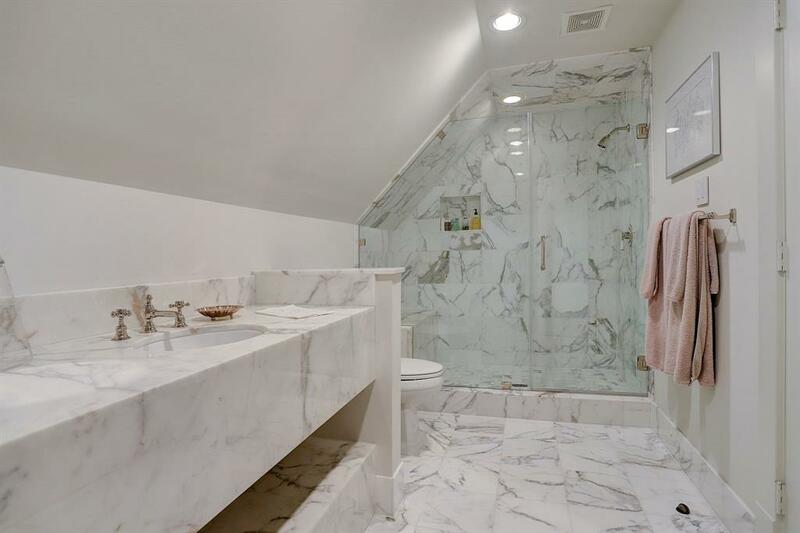 This third floor full bathroom design features: marble tile floor, and marble countertop as well as Waterworks polished nickel faucet, and shower with marble floor, surround and ceiling. Additionally, note the seamless glass enclosure, built-in shower seat, recessed lighting, vanity with marble top built-in storage, and Waterworks commode too. 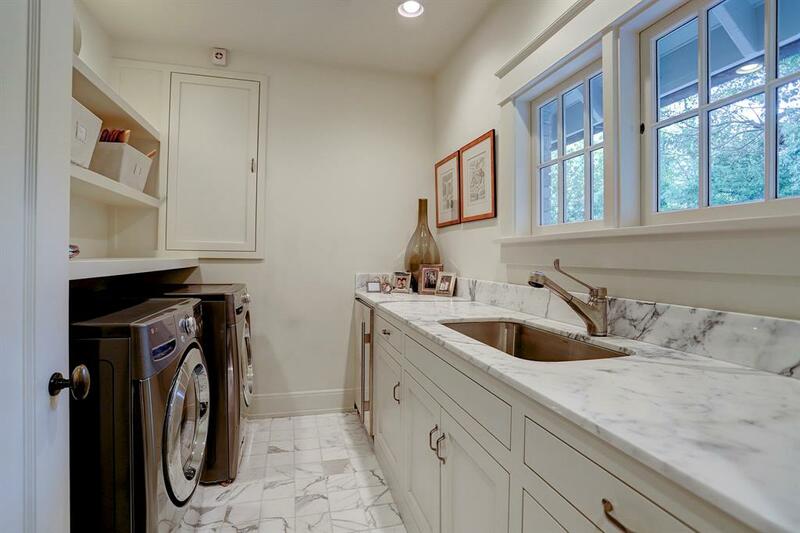 Luxe details in a laundry room. Design consultant: Pam Pierce. 12 Interior Design Details: Tudor in Houston – certainly lovely indeed. House tour: 1924 Tudor Revival. This utility room features design details such as marble tile floor, large stainless-steel sink, and custom made mahogany windows as well. Additionally, the space is graced with recessed lighting, flush mount cabinets and drawers (fully extendable drawer glides with soft close), statuary marble countertop, and Sub-Zero under counter refrigerator. Windows can certainly be a luxurious design element to enhance the chore of laundry in a room that is used so often. Guest house over garage. Design consultant: Pam Pierce. 12 Interior Design Details: Tudor in Houston – certainly lovely indeed. House tour: 1924 Tudor Revival. The guest house features design details such as wide plank hardwood floors, and museum finished walls. 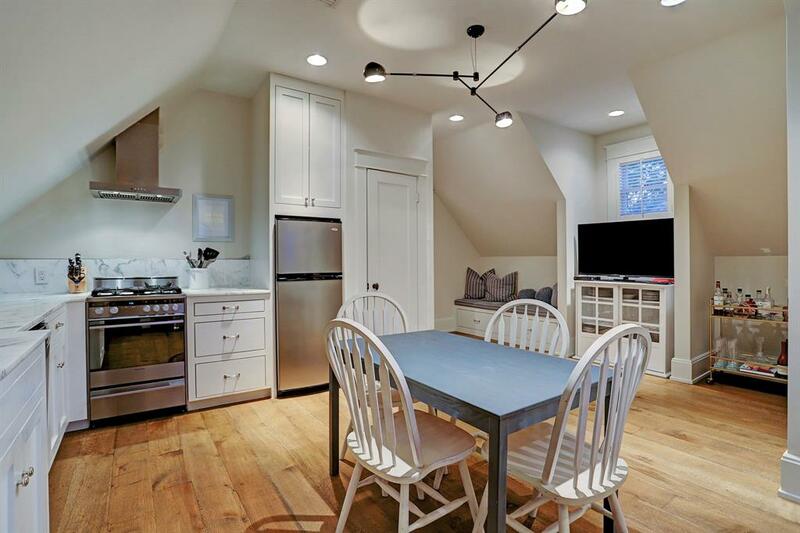 Additionally, note recessed lighting, marble counters, and backsplash. Custom cabinets and drawers as well as Waterworks sink, faucet, and knobs. Large pantry as well as custom mahogany windows and stainless steel appliances too. Clearly the sweetest luxe kitchen in a guest house over garage! Design consultant: Pam Pierce. 12 Interior Design Details: Tudor in Houston – certainly lovely indeed. House tour: 1924 Tudor Revival. The guest house features design details such as wide plank hardwood floors, and museum finished walls as well as recessed lighting, marble counters, and backsplash. Additionally, custom cabinets and drawers, Waterworks sink, faucet, and knobs, and a large pantry complete the space. Custom mahogany windows as well as stainless steel appliances too. Luxurious Interior design details in the guest house bedroom include wide plank hardwood floors, museum finished walls, and recessed lighting as well as built-in desk with marble countertop. Additionally, note: built-in cabinets and drawers, plantation shutters, and custom curtains/rods as well as custom built mahogany windows. Design consultant: Pam Pierce. 12 Interior Design Details: Tudor in Houston – certainly lovely indeed. House tour: 1924 Tudor Revival. This beautiful and luxurious perch at the end of the bed is so much more inviting than a plain ol’ bench and creates an instant “sitting room” within the bedroom. Guest house full bath. Bathroom design details include: tile floor, marble counter-top, wallpaper walls and ceiling, and shower with seamless glass door too. Design consultant: Pam Pierce. 12 Interior Design Details: Tudor in Houston – certainly lovely indeed. House tour: 1924 Tudor Revival. Ahhhhhhh! If budget were no object, I could move right in! A key source of beautiful materials for this home? 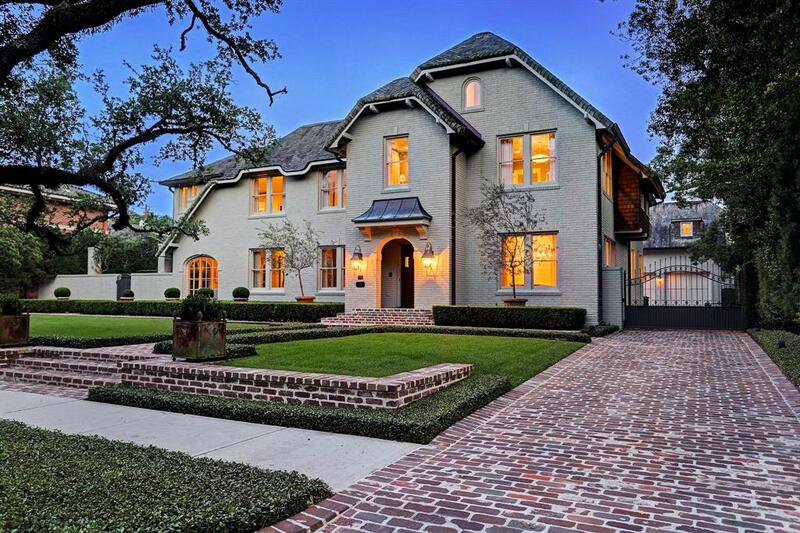 Chateau Domingue in Houston. Read more about them and see a heart-throb of an authentically French country home RIGHT HERE. Last spring, Studio McGee unveiled this beautiful house makeover for a client in Denver. 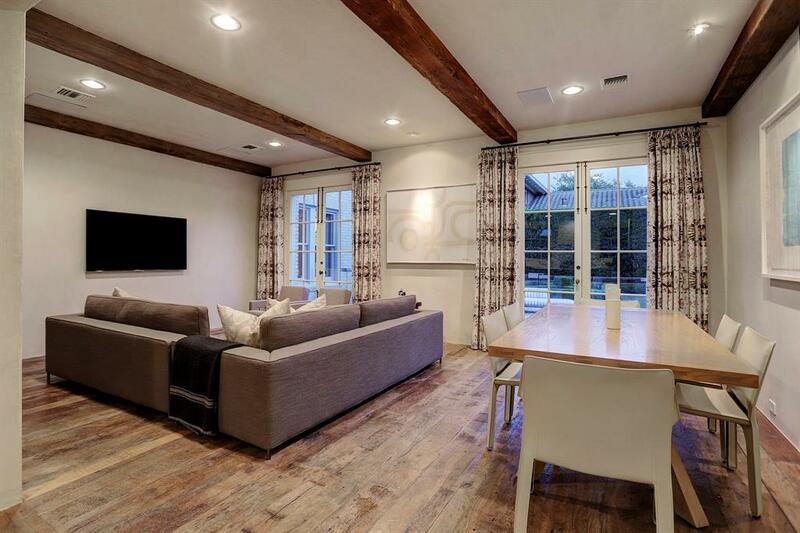 The look is decidedly more fresh modern farmhouse and casual in style and a departure from the more luxurious design approach taken in the Houston Tudor above. Best of all? You will also learn all the paint colors used in the home! (It is worth your time to watch the whole video as more paint colors are revealed as the tour continues!) So even if the style is not one you are fond of, it’s helpful to get a glimpse of how these designer-picked colors work together in bringing the look together and freshening an older home. First, do you love Tudor style homes? Second, ever lived in one? 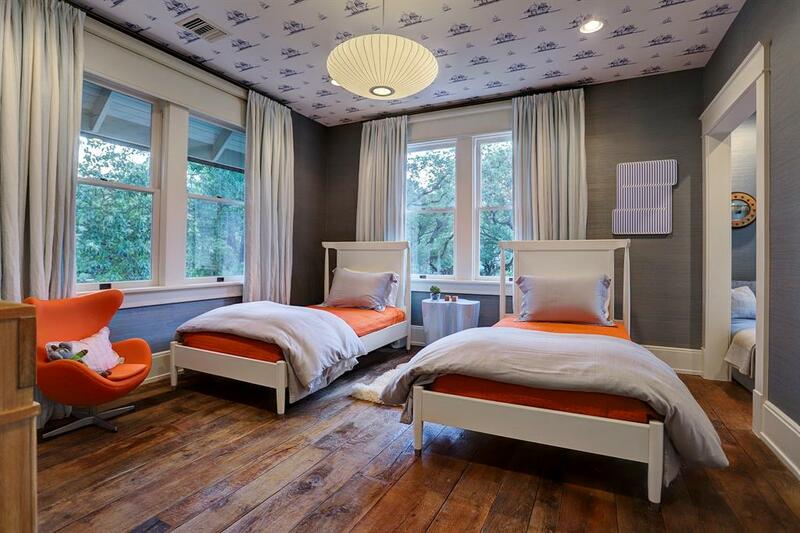 Third, have a favorite design element from this Houston home? Congratulations on making the shortlist!!! You deserve it!! Congratulations to you – I raise my glass to you and hope you win! Congratulations on making the short list! You do have the best written blog out there! I never lived in a Tudor but love them and this one is amazing. My fav room is the study, I love the design of the shelves. The marble bath is stunning, so sumptuous! Congratulations on your success. I hope that you make it to London and that you WIN! So well deserved. Love this house, so many great spaces. I’m just muddling through, Elizabeth and so pleased to make it to the short list of nominees. Thanks for your encouragement.